This week Families Australia will convene the 8th annual meeting of the National Coalition on Child Safety and Wellbeing in Canberra. Around 100 delegates from around Australia will participate. It will be an important opportunity to track the progress of the National Framework for Protecting Australia’s Children 2009-2020, Australia’s first-ever plan of action to be endorsed by the Council of Australian Governments to improve child safety and wellbeing. Against that background, the National Coalition meeting will consider ways forward for the last three-year action plan under the National Framework and, importantly, the shape of national policy after the National Framework concludes in 2020.
through to developing the National Framework’s early action plans. As to the future, it seems abundantly clear to me that the next few years will see continued growing demands for systems transformation, demonstrated impact, and new ‘disruptive’ approaches. Contextual factors include calls by two recent Royal Commissions on the abuse of children and young people for fundamental reform, the expected trebling of the number of Aboriginal and Torres Strait Islander children in out-of-home care in the next 20 years unless significant change occurs, and the inability of foster and kin carers to meet demand as more children enter out-of-home care. There is a clear, strong case for stepping-up national policy efforts after 2020. The National Framework is an important foundation for a broader national initiative on child wellbeing and family strengthening that might, for example, give even stronger emphasis to early prevention and family support, with top priority also accorded to Aboriginal and Torres Strait Islander children and families. 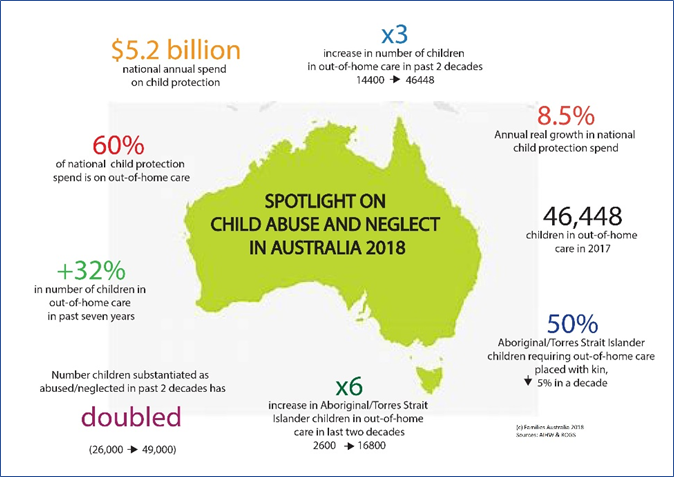 The evidence around continued growth in the numbers of substantiations of child abuse and of children entering out-of-home care requires our leaders to build an even bolder vision and plan for the future.